Sunway Holdings Bhd is a conglomerate with most of its operations concentrated in construction. It is also involved in other business segments such as property development, quarry, trading (Hoses, fittings, heavy equipment and heavy equipment parts) and building materials (pipes, pavers and wall panels). The company had just released its 1Q 10 results and earnings were fantastic, the highest ever recorded for the company. Net profit stood at RM39.9 mil (excluding derivative gains will make it approx. RM35 mil). 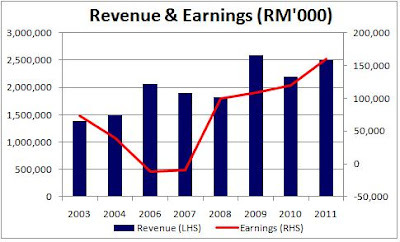 Consensus estimates its earnings will touch RM120 mil and RM160 mil in 2010 & 2011 respectively. EPS for 2010 and 2011 will be 20 sen and 26 sen respectively. 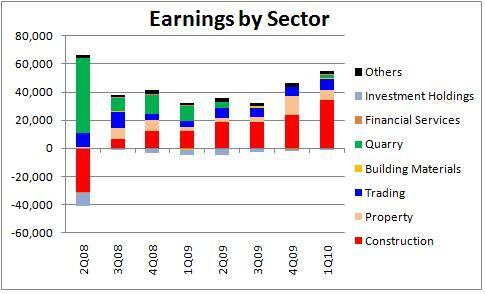 Therefore PE for 2010 and 2011 earnings is very low at 7.3x and 5.6x respectively, as compared to its peers i.e. Mudajaya, IJM, WCT and Gamuda which have an average PE of 14-15x. 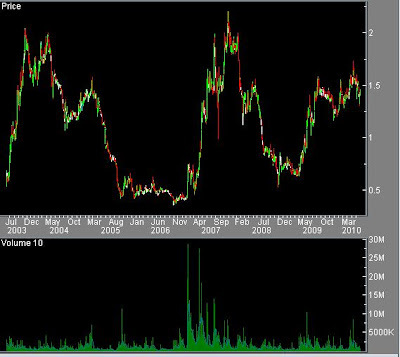 By attaching PE of 10x to its earnings, target price should reach RM2.00, representing 43% upside. The company has been laden with losses from its venture into SunInfra in 2006-07. In 2008, it finally disposed of its stake in SunInfra, which would not drag the company earnings anymore. In addition, it divested non-core assets such as Plaza Masalam and Sunway Hanoi Hotel totaling RM133 mil and is planning divestments including Wisma Mas and Subang Square totaling RM76 mil. Its warrant conversion could potentially raise another RM320 mil (246 million warrants @ exercise price of RM1.30). Nonetheless, I think warrant holders will wait until the share price have moved up substantially to convert as current price is too near the exercise price. All the above are aimed at reducing its gearing. Consequently, Sunway's net gearing was pared down substantially from 112% in 2007 to 58% currently through its divestments and corporate exercise. 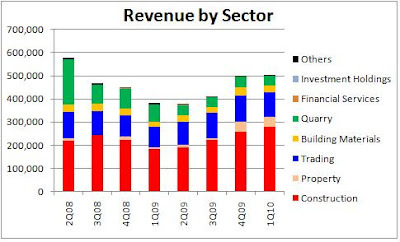 It is targeting net gearing of below 50% which could be achieved easily from its earnings by FY2011. It has tendered for a massive RM16 bil worth of projects with expected success rate of 10-15%. Annual replenishment of orderbook could reach RM1.5 bil. Among the project bids include LCCT, Putrajaya projects, Suncity projects, Indian roads, Legoland (Iskandar Malaysia) and Abu Dhabi projects of which it stands a high chance of winning owing to its construction experience in all these areas. 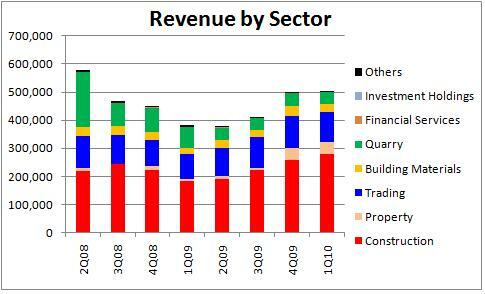 Quarry, trading and property earnings have been providing consistent support to its earnings. Property launches are expected to be around RM800mil this year and it has about RM1.9 bil worth of outstanding GDV. In conclusion, owing to its higher profitability (Its earnings have never been this high historically), healthier balance sheet, strong orderbook and strong prospects in contract flows from a variety of clients, the company deserves expansion in its PER.